by Constance Foster, from the USTimes bestseller list. Sonia Pressman Fuentes moves easily between many differing worlds. Her memoirs EAT FIRST, YOU DON'T KNOW WHAT THEY'LL GIVE YOU is a composite of those worlds and how they have impacted her life and consequently, how she has impacted our lives. Because if you are a U.S. citizen, Sonia Pressman Fuentes has impacted your life regardless of whether you recognize her name or not. Starting in 1965, Fuentes became involved in women's rights. Today, thanks to pioneers like Fuentes and Friedan, our world has changed drastically. But for someone like Fuentes, change has always been a key word. Her roots are deeply imbedded in Eastern European Jewry. Fuentes herself was born in Berlin and came to the US with her family to escape the Holocaust. Her career has been nothing short of staggering. She was the first woman attorney of the Equal Employment Opportunity Commission. She later became a founder of the National Organization Of Women, the Women's Equity Action League, and Federally Employed Women. After a 36-year career as an attorney and executive with the federal government as well as multinational corporations, Fuentes 'retired' to pursue writing and public speaking. 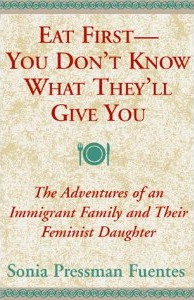 With EAT FIRST, YOU DON'T KNOW WHAT THEY'LL GIVE YOU, Sonia Pressman Fuentes has essentially woven a reflection on the various ways in which family, society, culture, and political engagement have always lived in creative tension. This book is a joy to read and a must for anyone who is interested about the beginnings of the women's movement in the U.S. As present president of NOW, Patricia Ireland, says, "I walk in the footprints of Sonia Pressman Fuentes". Not a bad accolade for a kid whose family hails from a Polish shtettl. As the old ad said, "You've come a long way, baby." Sorry, my 60's are showing.